Beyond the casinos, past the clubs, over the glittering, multi-million dollar hotels that light up the Las Vegas Strip, beat the quiet drums of innovation and progress. Change is afoot. 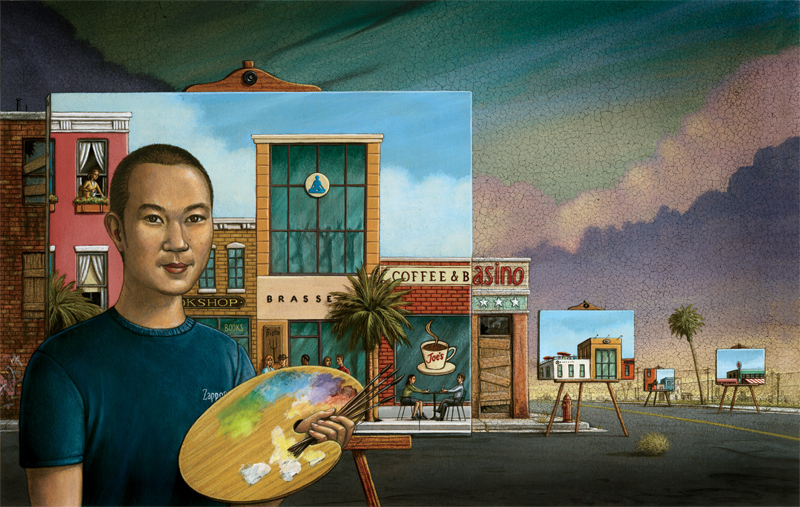 Las Vegas is on the verge of a renaissance, thanks, in part, to the fantastical vision and persuasive passion of Zappos CEO and Delivering Happiness author, Tony Hsieh. What began as a relocation project, moving the online shoe and apparel shop headquarters from its Henderson location to downtown Las Vegas, has blossomed into a revitalization project, breathing new life into an area all too often described as seedy and run-down. By the end of 2013, Zappos will take over downtown’s old City Hall building, which will receive a major renovation to accommodate 2,000 of its employees (the Henderson office is home to approximately 1,200), and several blocks of surrounding real estate have been procured to round out the “Zappos campus,” serving as a spark plug to the surrounding area. It’s all part of Hsieh’s vision to make downtown Las Vegas a vital community — attracting families, urban dwellers, and business owners — to not only visit, but to live and thrive, with art galleries, yoga studios, coffee shops, book stores, sporting events and charter schools. Hsieh is investing $350 million into the Downtown Project, with $200 million in real estate development, including residential, $50 million for small business investment, $50 million for education, and $50 million for start-up investments, in companies who are already in Las Vegas or are willing to relocate to downtown. The start-up investment is a ripe opportunity for seedling companies looking for the right environment to get off the ground. Besides providing a lower cost of living, compared to many start-up hubs, the Downtown Project offers access to mentors, space and peers. We’re less about comparisons and more about creating something new. Most cities have their fair share of incubation programs and other formal ways to accelerate learning and happiness. We see an opportunity to create a form of an incubator in an entire city, but without the formalities. So if you consider the elements that make up an incubator (proximity to mentors, proximity to others like you, access to capital and space) we think those things can be more organically scaled if they are a part of a city. Taking a cue from the edicts in Triumph of the City, the project aims to make downtown Las Vegas a great place to eat, meet, work, live, learn, and play. After witnessing first-hand the kind of company Tony Hsieh has built with Zappos — during my recent headquarters tour, one senior woman commented, “Boy, would I have loved to work here when I was young” — I have no doubt the project will be a success. In fact, it’s the only Vegas bet I’ll make.